The severity of damage a water leak can cause depends on a number of variables: the size of the leak, the location, the quality of the plumbing, the temperature outside, etc. The last thing you should do is fool yourself into thinking that a small leak can’t turn into a big problem though. Just ask the owners of these vehicles, who came home from work one day to find their cars encased in several inches of ice due to a pipe bursting in the dead of winter. Property damage resulting from water damage due to plumbing failures and freezing pipes is the second most common cause of homeowner loss, and water caused $9.1 billion in annual homeowner policy property losses annually between 2007 and 2009. What kind of damage can be done? The dangerous and expensive kind. Here are a few examples of how costly (both to your wallet and to your health) not fixing those water leaks can be. We’ve all heard the horror stories of pipes bursting, basements flooding, and houses becoming completely ruined because of water damage. The example above doesn’t need any more explaining, and it doesn’t take a plumber to know that a ton of water can easily ruin a home. Even small amounts of water damage, if not taken care of, create a perfect environment for mold and bacteria to grow. Not as noticeable as a monsoon-type flood, but just as dangerous, and it has to be taken care of. 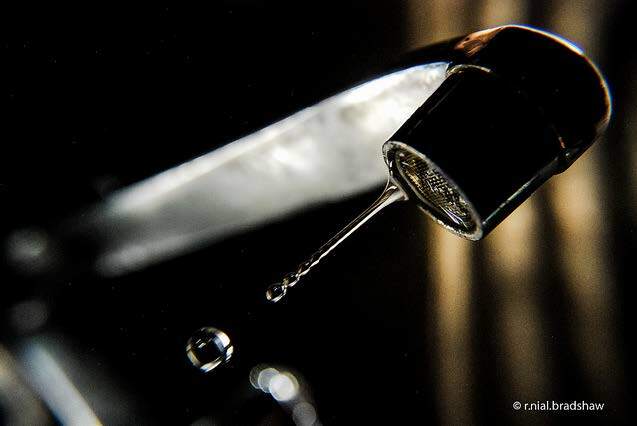 In an average residence, 22 gallons—yes, gallons—of water are lost to leakage each day. If that didn’t get your attention, then look at it this way. The average home loses about 14% of its water to leaks. You’re paying 14% more each month for water you never even use. What makes those stats even more heartbreaking? It is estimated that up to 93% of the cost of water damage could have been prevented or minimized if an automatic leak detection and shut-off system had been present in the homes. The worst part about this fact is that not only are you paying for the extra water, you’re paying for the problem the extra water creates for you. It really is a double-whammy. Of course we’re not going to leave without suggesting a few practical steps you can take to prevent leakage and water damage. 1) Keep a close eye on your water bill. Large fluctuations might signal a substantial leak. 2) Regularly check water-based appliances (dishwasher, washing machine, fridge, etc.) for leaks. 4) Install automatic shut-off values at individual appliances and fixtures incase they malfunction. 5) Similarly, install a flow sensor that detects plumbing leaks and shuts off water for the entire house. 6) Use a moisture water meter to find hidden leaks. You can determine if you have moisture behind your walls. 7) If you spot a problem, fix it quickly! 8) When you're going to be gone from your home for an extended period of time, turn your water off to the house. Make sure your pets on and plants on automatic watering systems still have water though. If you haven’t experienced water leaks in your home at one point or another, consider posting a few tips and tricks on how you monitor fixtures and keep everything sealed up tight. For the rest of us, keep in mind the steep costs of little leaks, and get in the habit of regularly preventing, detecting, and fixing leaks before they become a big problem. How do you prevent leakage in your home? Please share a few tips in the comments! Do you ever hear the toilet flush when no one's in the bathroom? Is it your imagination or is it something else? Perhaps you've got a ghost in the bathroom. In this RYCO Plumbing DIY, we'll show you how to become a ghostbuster and eliminate that self flushing toilet. A few weeks ago I posted a blog titled "Is Water Softening A Scam?". While many people on social media enjoyed reading the post, we thought a video might further drive home our point. Not having a water softener does not clog your pipes. Watch the video and see for yourself. Is Water Softening A Scam? Many water softening sales people sell you based on fear. They want you to believe that over time, a home without proper water conditioning will have restrictive buildup in the pipes that will lead to eventual failure. They want you to believe this because it's easy to sell someone who's afraid. See the calcified pipe below? That is what they want you to believe is happening in your pipes if you don't have a water softener installed. We're about to bust that myth with hard evidence. What they want you to believe. What is hard water? What is soft water? And why the heck does it matter? These are the most common questions homeowners ask themselves when the topic of water softening gets brought up, and you’d think the answers would be simple enough to find, but they’re not. Advertisers will tell you one thing about hard water. Plumbers will tell you another. And your neighbor will disagree with them both. Plenty of misconceptions about hard water have developed, making the truth difficult to come by. Here are a few common misconceptions of hard water you don’t have to be fooled by anymore. This is the one advertisers really stress. They claim that the minerals in your water like calcium and magnesium can build up over time and clog your pipes. 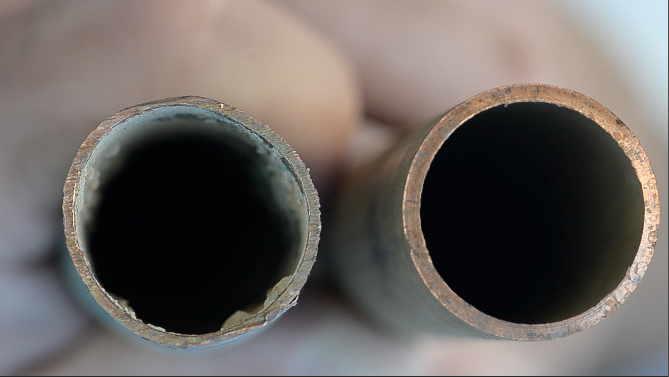 Without softening your water, you’re damaging your entire piping system. This just isn’t true . . . at least not anymore. Between the 1940s and 1970s most homes used steel (galvanized) pipes. 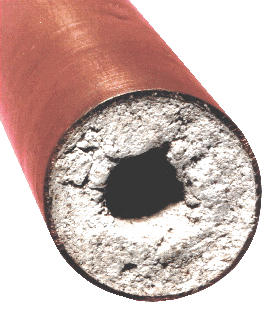 Minerals can stick to steel pipes, causing blockage. If your home was built after 1975, or if your home has been re-piped, you’re good to go. The copper pipes used today don’t accumulate minerals like steel pipes. Just the other day, we removed a 40-year-old copper pipe to fix a pinhole leak and found the line completely free of corrosion. This 40 year old pipe was removed from a home with a slab leak. The home had no water softening system. Compared to a brand new pipe, you can't see much of a difference. Many homeowners are being tricked into thinking that the minerals in water are endangering the health of their families. In reality, minerals aren’t contaminants at all. They’re nutrients. They’re natural, and they’re okay to consume. Sometimes we forget there was life before in-home water purifiers that get rid of all these minerals. Anyone who has ever drank from a well can back me up in saying how much better it tastes than the even purest tap water—minerals and all. A study by the World Health Organization shows that consuming hard water nutrients like calcium and magnesium can be good for your health. Similar to the last point, water softeners don’t filter your water. Dirty, chlorinated tap water goes into your water softener, and it comes out as dirty, chlorinated, salty water. It may taste a little better to you, but it’s still dirty, and there still needs to be a filtration process to make the water safe. Don’t be convinced that your water softener is a multi-use piece of equipment. It removes the magnesium and calcium ions. That’s it. High quality water filters are still to thank for removing those nasty chemicals and contaminants in your drinking water. When you wash your clothing, calcium and mineral deposits do stay in the fabric and may cause them to wear a little faster, but let’s not get ahead of ourselves here. Hard water is not the only culprit. You’ve got an entire team working against your to fade your clothing. Chlorine does plenty of damage too, and as we just discussed, water softeners don’t filter chlorine. They don’t filter dirt either, which can also get trapped in the fabric. Combating these issues can be as easy as choosing detergent-based products for your laundry rather than soap-based products. Detergent-based products work much better in hard water. If you’re still worried, you can also add water softener to your laundry to get rid of those minerals. Just remember that the minerals aren’t the only problem. Be careful when researching information on water softening and always consider the source. Plenty of businesses have agendas and will twist facts to make you believe that their products are more necessary than they really are. Knowing the truth about hard water can help you sift through all the misconceptions and make sound decisions about softening your water. What other misconceptions have you heard about hard water? Backflow issues at commercial and residential buildings can be health hazards. A lethal gas in a building in Mississippi is the latest example of what can happen when there is backflow. The building owner entered the unoccupied building and noticed a smell. A report was filed with the local fire department and the responding team was able to make the building safe again. Investigators believe a chemical made its way into the sewer lines creating the toxic gas, which then entered the unoccupied building as a backflow situation through a sink. Toxic gas backing up into a building is one example of potential backflow issues, but backflow can occur in many other ways. Backflow is generally referred to as the reversal of a liquid or gas in a plumbing system. Most issues for the public occur with backflow resulting in contaminated drinking water. If you look up backflow issues online you’ll probably find references to “potable” water. That means drinking water. There have been backflow issues in the past with drinking water. Chemicals, sewage and other contaminants have found their way into drinking water causing health issues for those that count on the fresh water. In a residence or commercial building water generally flows one way. This normal flow is usually driven by consistent pressure in the water and waste system. Anything that changes the normal pressure in the system can lead to backflow. Fire hydrant use or malfunction can reverse the normal pressure in the system on a city line, but backflow can occur in a number of different ways. Sometimes backpressure might be caused by someone using a garden hose and submerging the end of the hose in a pool of liquid. If pressure is lost the flow could reverse and contaminants could be released into the drinking water. Anytime there is a connection between contaminants and the drinking water there is potential for a backflow issue. Sometimes these connections are not immediately obvious like the garden hose connecting to a building’s drinking water supply. The Environmental Protection Agency (EPA) provides guidelines and regulations for state and local governments regarding backflow. State and local governments also have their own guidelines and regulations for backflow prevention. Arizona has its own backflow regulations. 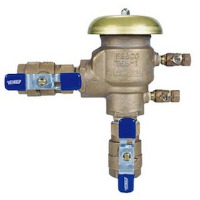 Due to issues with backflow in the past, regulations require backflow preventer devices to be used in nearly all residential and commercial buildings. 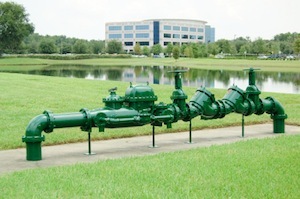 A backflow preventer is a device that prevents backflow as cross-connection points where potential backflow issues may occur. While backflow is not a common occurrence, preventers are in place to make sure there is no contamination should something malfunction or go wrong with a building’s water supply. Arizona and other states require regular backflow testing or backflow preventer testing. There is a list of steps to follow when checking the system. Because plumbing systems are exposed to normal wear and tear, it’s a good idea to have regular check-ins on your property. Federal, state and local law also requires regular backflow testing. We work with property managers that like to stay on top of their plumbing systems. They see the potential harm and damage that can happen with backflow issues and they have us come out to test their systems to make sure everything is working. This testing also ensures the property management company and its properties meet all regulations. Do you have questions about backflow and backflow testing? Contact us today and ask about our backflow testing procedure.